Exciting news if your name is ME. I am thrilled to announce the details of my very first ever public exhibition of my photographic work, I have had many in the past but they are always in my own house and I’m the only person to see them. The exhibition will feature 20 [or 22] large format framed landscape prints. I’m probably stating the obvious here but they are all black and white photographs, I’m sure you guessed that one already. It will all take place in the luxurious surroundings of the Workmans Club on Wellington Quay. 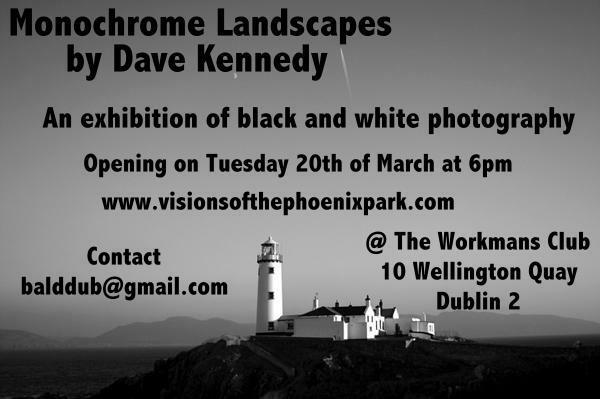 I will be opening the exhibition on Tuesday the 20th of March with a special launch night starting at 6pm. If you know me then consider yourself invited [if I haven’t already emailed you about it]. I would love you all to come along, there will be a few free beers for everybody, some music and the possibility of me breaking out into high art tinged conversations [as if]. Seriously though, I would love you all to come along. The exhibition will run for at least a month and a limited number of framed prints of each photograph will also be available for sale. This entry was posted in Photography and tagged Exhibition. Bookmark the permalink. The place only opens from 5pm every day though, only a minor downside. AMAZING!! Wish I could come. Best of luck to you I know it will be a huge success!! Nervous about letting the general public see my photos for the first time now. Thanks Val, running for at least a month. Doesn’t open til 5pm each day though, that’s the only downside. Thanks Chloe, I’m so excited about it. Oh well, it was worth a try at least. Congratulations, I am sure it will be a success. I will make it in at some stage while the exhibit is running. Thanks so much Brendan, much appreciated. I would love to hear your thoughts about the photos if you do make it in to the exhibition. Just to let you know the venue itself doesn’t open until 5pm each day. This is great news. Well done! Unfortunately cannot be there due to living in Australia. Have a wonderful time. No problem, I think your excuse is a valid one.